Introduction: Advantages and Disadvantages of Flexures. Goals of Flexure Design. Essentials: Basic Elasticity. Behavior of Materials. Fatigue. Bending of Symmetric Beams. Rigid Body Dynamics: Linear Systems Theory. Vibrations and Natural Frequencies of Continuous Systems. Flexure Elements: Leaf Type Springs. Notch Hinge. Two Axis Hinges. The Four Bar Link. 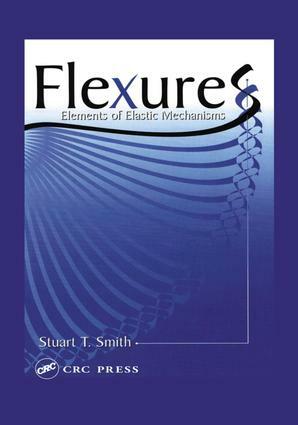 Flexure Systems: General Model for Dynamics of planar Flexures. Hinges of Rotational Symmetry: The Disc Coupling. Rotationally Symmetric Leaf Type Hinge. The Bellows as a Flexure Element. Levers. Manufacturing and Assembly Considerations: Machining and Heat Treatment of Some Common Flexure Materials.